The weather here has been a little cooler than normal for this time of year, but when I picked up Christmas at Rose Hill Farm and started to read it, it felt a little strange to think about reading a Christmas story in September. I was glad as I started to read to learn that Christmas was part of the setting, and not part of the story. 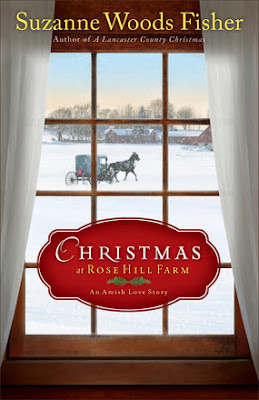 Christmas at Rose Hill Farm was the first book that I read by Suzanne Woods Fisher and I found it very enjoyable. She does a good job of developing the lead characters, providing some other characters to provide some additional color on why the lead characters are who they are. I liked how she pulled in the back story in bits to help the reader understand some of the motives and actions and allowing the story to continue to advance in an uninterrupted style. As with many of the Amish books that I have read, I really felt like the fact that the characters were Amish was just a part of the setting and that the story itself was very universal and could happen with any community. The characters faced many of the dilemmas that we all face - drawing conclusions from incomplete information, running from rather than facing your fears, finding it in your heart to forgive those you love most, and recognizing the guidance and protection your faith can provide if you turn to it in times of need. She has a few series already published and based on this book, I would love to read a few of her other works. As the history of the lost rose is pieced together, it reminds Bess and Billy---and Amos, too---that Christmas truly is the season of miracles. "Filled with heart-twisting moments amid the sweet anticipation of love, this story will charm readers into the holiday spirit." Read more reviews on the blog tour page for Christmas at Rose Hill Farm.